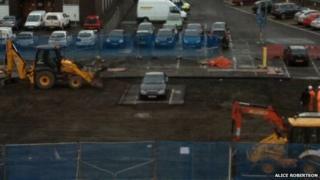 A driver is in for a shock after workers at one of Scotland's busiest railway stations cut up the car park around his vehicle, leaving it on a tiny island of asphalt. Workers at Edinburgh Waverley blocked off an area of the parking compound on Thursday ready for resurfacing work. But, when they turned up for work in the morning, a Mercedes had parked in the middle of the cordoned-off area. Undeterred, the crew dug up the surface all around the dark blue car. Workers did build a tiny ramp in front of the car to allow its owner to drive away on his or her return. A Network Rail spokesman said: "The car park had been cordoned off so we could begin work to resurface it and improve the lighting at the facility for our passengers. "The motorist moved the barriers and parked in the worksite, but we've left a ramp for them to exit and will be happy to return their vehicle once they contact us." Pictures of the stranded car made their way around social media after being spotted by members of the public. One commuter said: "I came back to my car and saw this Merc totally on its own. "It is pretty hilarious really. The owner has obviously totally ignored the cordon that had gone up and has been left there. "Fair play to the workers, they've just got on with their jobs." The work is part of Network Rail's £130m refurbishment project, which includes the roof being replaced at Waverley Station along with new entrances created and refurbishment to the station's concourses.